Office floor in the city. Krakow’s office space amounts to a total of some 1.31 million square meters and over 900,000 sq. m. are situated in modern buildings of high standard. And as much as 150,000 sq. m. of new A-class office floor have been added in 2016 alone. Developers plan to provide 200,000-plus square meters of new office space in 2017. The overall vacancy rate hovers around 6.3 percent mark. The days of massive demand for high-quality office floor area seem to last mainly due to influx of back office operations of foreign companies including multinationals, such giants as Google, Cisco, Shell, and HSBC among them. Monthly rents, inclusive of service charges, range from ten euros per square meter at the lower end of the market to euro 20 per sq. m. in the downtown top class-A office block with the average for the class A at 14 euro per sq. m.
Average yields on investment in new office space exceed ten percent. Quality mercantile facilities at Krakow’s Old Town’s busiest street, Florianska, and at the city’s central Rynek Glowny square rank among Poland’s priciest. Renting a ground-floor shop here costs euro 70-90 a month per square meter. Cellars or upper floors as well as courtyard locations are both less expensive and more readily available. At the same time other main streets in the historical district – Grodzka, Szewska, Sienna, Slawkowska – prove slightly cheaper, while some side-streets sites may turn out fairly affordable. 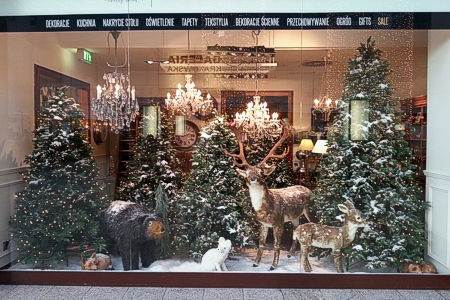 The festive season's shop window in a shopping mall in Krakow. Since mid-1990s shopping centers mushroomed in Krakow, with their biggest concentration in the area halfway between the Old Town and the Nowa Huta district. At the same time two big shopping malls, the 60,000-sq-meter Galeria Krakowska and the 36,000-sq-meter Galeria Kazimierz enjoy a central location. Notably the former, completed in September 2006 as the first part of the ambitious New City project, is strategically situated since it adjoins Krakow’s focal Old Town historic district and abuts on the central train station adjacent to the city’s main bus depot. Total floor area of Krakow’s modern retail facilities amount to roughly 700,000 sq. Monthly shopping-mall rents average euro 40 per square meter plus service charges to the tune of about 4.5 euro per sq. meter but vacancies are no longer scarce, notably in older malls. Median yields on investment in Krakow’s new retail space hover around ten percent. The city's warehouse space still amounts to pitiful 130,000 square metres despite fairly rapid expansion in recent years. Small wonder the vacancy rate is just five percent, the smallest among Poland's cities. Demand will surely surpass supply for many years to come even though new investments are expected to alleviate the shortage somewhat. Monthly rents for warehouse space in Krakow average 3.7 euros per sq meter. Over 25,000 beds await you in Krakow. Krakow's hostels, guest rooms, bed-and-breakfast. Copyright © 2004- 2018 by MAREK STRZALA. All rights reserved.